An applique with embroidery pillow cover is pretty in pink. A dish towel I found for 50cents at a garage/tag sale. A small table cloth with appliqued teapot and embroidery. I like the applique butterfly on another dish towel. to put some stitches to cloth. It colored their worlds. trunk, and linen drawer. Somethings I forgot I had. I am so glad I decided to share them with you. so come back and visit me on two more Monday Linen Days. Today is Tasha Tudor's birthday. one my favorite books about Tasha Tudor. The book is Tasha Tudor's Heirloom Crafts. marionettes, making toys, and The Dollhouse. The photography is just beautiful. have treasured this signed copy for many years. 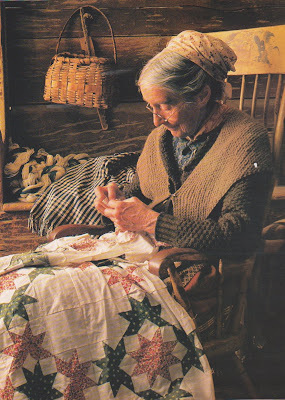 Tasha Tudor had for heirloom crafts. 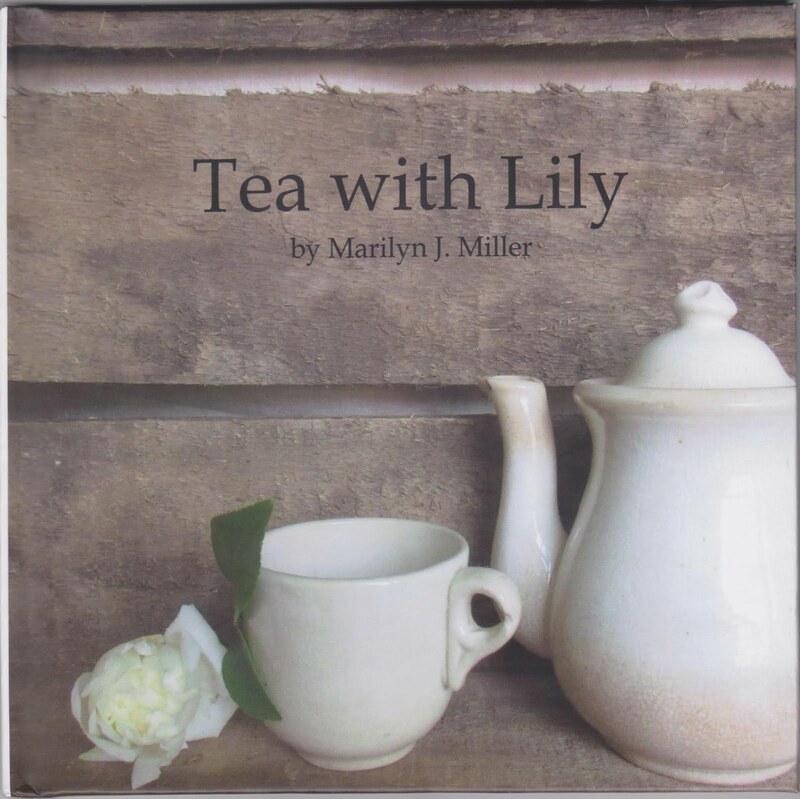 Marmalady's has just released a new sewing pattern for quilters that love tea. It is a Tea Serving Mat. It is an original design by me. Fun to place under the teapot and cups for serving. there is a crispness to the morning air. heavy branches of the trees. pluck it from the tree. taking in the sweet, crisp flavor of the apple. 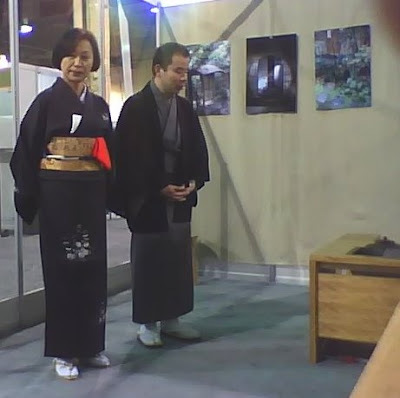 At the World Tea Expo this year there was an opportunity to participate in a Japanese Tea Ceremony. We were served a tea jelly as a palate cleaner to begin. 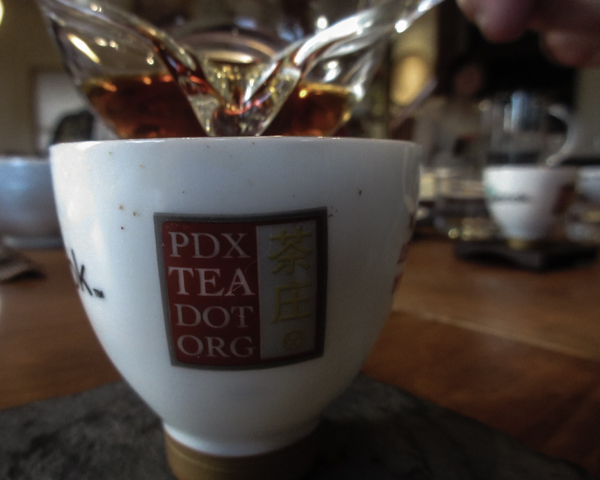 The Tea Master served each of us individually after he brewed the tea at the end of the table. 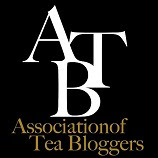 The hostess and the Tea Master. 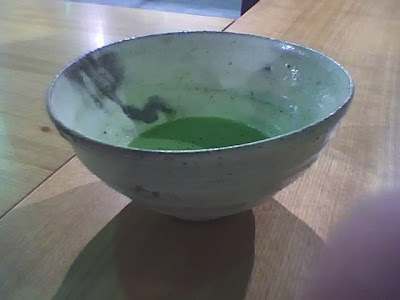 We drank Matcha Green Tea in bowls that were about 100 - 150 years old. 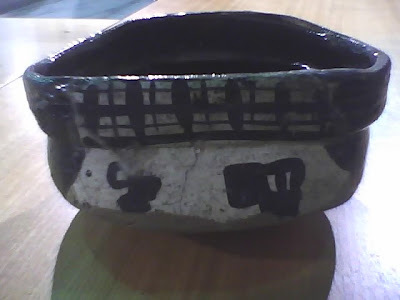 Another very old tea bowl, which I thought was beautiful. Before the tea ceremony we had to remove jewelry; so that we would not chip the bowls. Cameras were not allowed in the tea expo; so these were taken on my phone after we were told we could take them here only. Now not being very cell phone technical, I didn't know how to get them off my phone until now. Annie at In My Dreams called me and explained how to share my pictures with you. Thanks so much Annie! 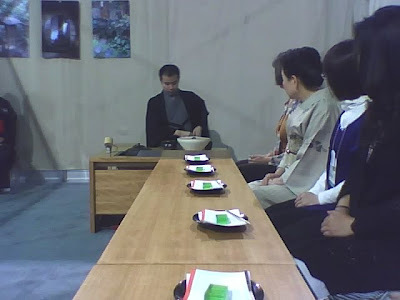 I have so much wanted to share the pictures from the Japanese Tea Ceremony. Today I open my trunk to more linens. You will see embroidery and some crochet. Small card table size table cloths and large pieces that just drape over the table. Applique and embroidery plus lots of yellow. Round table cloths and a small organdy one too. Decorative edges of crochet or tatting are fun. dresser scarves, pillowcases, tea cozies, and aprons. What fun, I love them all. but it will be something special from the linen cupboard. On preparing to take a journey, I have been reading books. by Nancy Lindemeyer, the first Editor-in-Chief of Victoria Magazine. "If our pages speak to the beauty of a woman's life through the artfulness of the things she has gathered about her, then we are dealing with intangibles that are not easy to quantify. 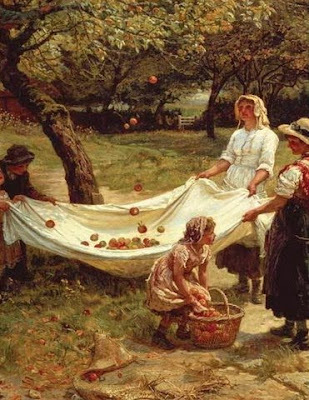 When our country was settled, our foremothers took with them in those covered wagons moving west a teapot from home, candlesticks that had been in the family, a tablecloth embroidered by a great-grandmother in Europe. Holding on to these reminders of home and family gave them the courage to go on." Have courage as we share together our journey. In design school we were encouraged to visit Maryhill Museum to see the fashion dolls. The fashions of post-World War II France are highlighted in this 1946 exhibit, featuring miniature fashions by the country's finest designers. as I went on to design a suit jacket with a similar feel and plaid. This is my favorite exhibit in the Maryhill Museum. I just love the little fashion dolls. new generation of shoes that look similar to the shoes we see now. however, each cycle still puts their own flair to the season. I still enjoy taking a peak in a Vogue Magazine at the beauty shop just to see what's happening in the world of fashion today. 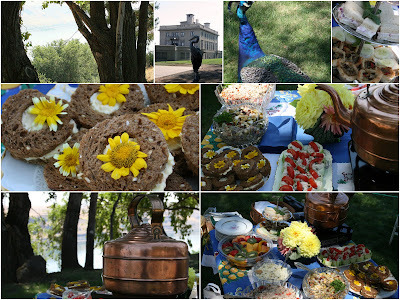 Joining friends for a potluck tea at Maryhill Museum in Washington was a treat I have looked forward to for a long time. Sitting under the trees enjoying tea, the view, and especially the company was pure pleasure. After tea we walked through the museum and enjoyed together photographs by Ansel Adams, Indian artifacts, and (my favorite) Theatre de la Mode. Double click on the collage to see the pictures in more detail. Picture is morning tea looking out on the water. A perfect setting to have tea. I call these my Marmalady's tablecloths because they have fruit on them. the others have been used too. The cherry one is the only one I ever was brave enough to cut and I still am not sure I should have done that. I made pillows with part of it. I love using the one with the pink stripe around the outer edge in the Spring for our family Easter tea. It just seems so "Springy" to me and it is larger than a lot of the vintage tablecloths you find. The tulip tablecloth is another fun one for Spring. The yellow flowers is fun to use with green depression glass plates at a tea party. Any vintage tablecloth is fun for a tea party when you can tie the theme into what is on the cloth. Enjoy having tea on a vintage tablecloth. Swing high as the sky. Funny, but the most difficult to say is Artist. I dream of being an artist, but could never really see it. I am now putting it out there to the universe. I am an artist. Sometimes I am Happy, Scared, Silly, Opinionated, Sad, Hungry, Full, Crave food, love alone time, Enjoy beauty around me, Like order in my life, feel old, feel young, hurt. Sometimes I just want to laugh for no reason at all, fly like the birds, swing as high as the sky, swim like the fish, or create a most beautiful master piece. Then there is the skirt I have wanted to sew for the past 25 years, is that the creative master piece sitting in the closet waiting to come out and be completed? Or what about that book that has been stirring in my mind for 5 years? Am I revealing too much or not enough? How about you, what do you have to share? What commitment can we make to open up and move forward past our comfort zones? It's scary, isn't it? I won't tag anyone to share, but the struggle is so worth it when the sun shines on the other end and we have that "Aha moment". Celebrate with me the moments of sunshine. I do believe that life's struggles are a good thing, they are what keeps us growing. Tomatoes from the garden just bursting with the wonderful, juicy flavor of home grown. I have been struggling with thoughts this past week on who I am and honoring who I am within myself. Do you struggle with those thoughts sometimes? How do you come to resolution about these struggles? Sometimes it just seems like I will burst with the struggles of life. It has been an amazing process in the last few days. When we open ourselves up to struggle with an issue and take note we start noticing things that weren't there before. I had to struggle with being true to myself first by acknowledging differences of opinion between friends. How to deal with that one was not easy and it really tore at my heart. Then who am I as an example to other women. Who I am to my family, and finally who I am to myself. During this time of struggle I viewed the movie Julie and Julia. Watching both women struggle with who they were at that time in their lives really hit home and brought me to tears to understand that we all have our struggles. In the movie Julia says (and I am not quoting exactly) French women don't do anything, that's not me I must do something. Through our struggles to find who we are, we grow. As Julie and Julia struggled; so do I. I hope then I grow. Christina at Soul Aperature had a list of "I am". I have been working on that list for myself and struggling with some of the words that I have written down. Then Merisa at Getting Back to Basics wanted me to share 7 things about myself, and again I was thinking what is there to share about me. Both women ask me to reveal who I am. It is a little scary to reveal my heart even though I share my delights, that is only a part of me. Tomorrow I will share my own list of Who I Am and some things about me. Two requests have come to me lately. One to update regularly on the greenhouse and the other to see how I framed the quilt squares and hung them in my office. First I must comment on the greenhouse. It is my husband's dream to have a greenhouse, a place of quiet meditation. He started it about 4 years ago and each year in our Christmas letter to friends I mention the greenhouse is still in progress. It took some time to find the recycled materials. He found them just laying along the road or in a demolition sight. Yesterday he rebuilt a couple of the windows that will soon go into the greenhouse. It is his labor of love, but a very slow progress. When it is completed I will share again with a slide show of the whole progress. but I can imagine a party there too. When I was sharing about quilts I mentioned a dear friend had given me three vintage quilt squares. Here they are now hanging in my office. It looks like the top one has shifted in the frame, I will need to fix that soon. I love them hanging by my desk. Thank you dear friend. the old show tune, "as high as an elephants eye". and tell us the sky is the limit. Vintage tablecloths is the heart of my love of linens. The top right tablecloth was one of my first and is beginning to show it wear, but I still love it. When they have a hole, I just layer it with other tablecloths. I love pairing several together. I had no idea when I pulled them out to photograph them that there were so many in the cupboard. The tablecloth with yellow roses I use when I have a table at the Portland Rose Society Vendor Fair. It is a fun one to have with a big bouquet of yellow roses. The second from right one is fun to use when we serve a Mexican dinner or the one second from left is used in the winter with pinecones. You see they are loved, but they are also used. I often have a pile in the ironing. I actually love seeing them there, as I enjoy the pattern as I iron them. Also just for fun I thought you would like a sneak peek at the greenhouse my husband is building out of recycled windows, floor, bricks, and doors. The tablecloths mostly come from the 1930's and 1940's. very well into our home. But I do believe anyone would enjoy one of these beauties, even if it is maybe for picnics. They really cheer up any picnic table, tea table, company table, or everyday fun table. There will be more tablecloths to come next week. Picture is from a card given to me by my daughter. And when I am free. 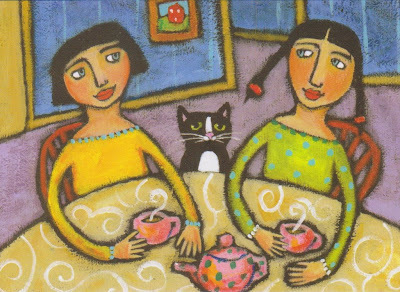 Enjoy a cup of tea today with a cutie or a kittie and laugh your cares away. A new way to beat the heat of summer - oolong tea jelly. This is a traditional Taiwan food and easy to make. It offers a refreshing, cool snack. the sugar, this jelly is also nice unsweetened! Awww! Now this is it. I still like the effect of the water on sunflowers. Bathing them in drops of water makes them smile. It's sort of like "raindrops on roses". Funny, but when I thought of showing you my collage and explaining what came to mind in explanation was "work'n it out". 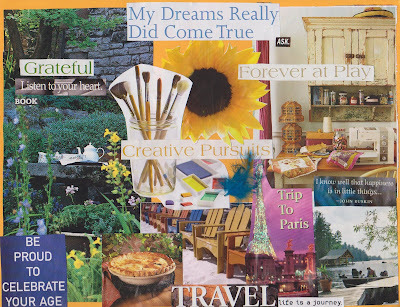 Have you ever done a collage to "work it out", to help you figure out your next direction or what is in your heart? This was my collage I made at the beginning of the year. I hadn't looked at it for awhile; so it is fun for me to see where I am in my year and see if I am on track. I am a very visual person and seeing pictures helps me along life journeys. I am beginning to scan magazines now for next year and after Christmas I will work on my collage for next year. But for this year I think I am on track, at least I am working on it. Vintage napkins are so fun to find a garage/tag sale. Someone cared enough to embroider and edge each napkin so beautifully. The napkins are used and loved. but we use simpler cloth napkins for everyday.